Some of Devon and Cornwall's best-known beaches have lost their top-rating in the latest Good Beach Guide, because their water is not clean enough. Fourteen of Devon's beaches and 17 beaches in Cornwall have seen a drop in their measured water quality from the highest standard. Heavy rain causing flooding and run off from fields is being blamed. There was a 16% drop in the number of UK beaches with excellent water, said the Marine Conservation Society (MCS). Devon beaches which lost the top water quality rating are: Bovisand, Wembury, Challaborough, Bigbury on Sea - North, Bantham, Thurlestone North and South, Paignton Sands, Dawlish - Coryton Cove, Dawlish Warren, Sandy Bay, Budleigh Salterton, Beer and Seaton. The Cornwall beaches which lost the top rating are: Polzeath, Daymer, Trevone, Crooklets, Harlyn, Treyarnon, Porthcothan, Watergate, Crantock, St Ives - Porthminster, Gorran Haven - Vault Beach, Pentewan, Charlestown, Millendreath, Downderry, Cawsand and Kingsand. Six Devon beaches failed the minimum water quality standards - Combe Martin, Instow, Plymouth Hoe - East and West, Mothecombe and Exmouth. 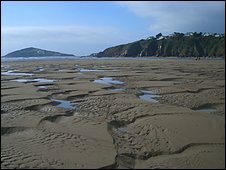 Beaches that failed in Cornwall were: Rock, Porth Beach, Porthluney Cove, Par, Readymoney (Fowey), Looe East and Seaton. Devon beaches that moved up to the top award were: Hope Cove, Hollicombe - Torbay, Watcombe - Torbay, Maidencombe - Torbay, Ness Cove - Torbay and Ladram Bay. Cornish beaches that also moved up were: Widemouth Sand, Crackington Haven, Perranporth Village, Mounts Bay and Portwrinkle. The Marine Conservation Society (MCS) recommended 370 UK beaches out of 777 tested - a drop of 74 since 2008. This is the biggest annual fall in the guide's 22-year history, and the first time since 2002 that under half of UK bathing beaches are recommended. The MCS said rain had swept pollutants such as raw sewage into rivers and sea. "Today's results reflect last summer's heavy rain which swept waterborne pollutants like raw sewage, petro-chemicals and farm waste into rivers and the sea," said Thomas Bell, MCS coastal pollution officer. "MCS is now recommending 25% fewer beaches than three years ago and we're becoming concerned that the existing infrastructure for handling storm pollution may not be up to the job." The MCS is calling for specific counter-pollution measures, such as investment in more sustainable urban drainage systems, new farming practices and expansion of the sewers system to handle storm water. It says this is necessary in the face of changing weather patterns brought on by climate change. Mr Bell warned bathers that to avoid health risks, they should pick places to swim in the sea which had a good water quality record. People are advised to stay out of the water for at least 24 hours after heavy storms and report pollution problems to the MCS.